Neophytes or automatic spell checkers often confuse ceramics and ceramides. Although the spelling is quite similar, their functions and characteristics are quite different. This term ceramides appeared in the cosmetic language at the end of the 80s. Yves Le Guen and Karl Lintner recount the research that preceded the development of the first synthetic ceramides, also known as pseudoceramides. The term ceramides has appeared in the cosmetic language given that some work on epidermal differentiation has brought to light the existence of structures that were virtually unknown, but which have proved important in physiology and cutaneous homeostasis. These substances were already known to biologists and neurobiologists because they are very often found in nerve tissue. Indeed, they are often used in the composition of sphingomyelin. But in the current world of cosmetics and/or dermatology, these substances had not yet taken on the character they have gradually acquired. Much work has focused on characterizing this process, but it is mainly Wertz and Downing(1), then Peter Elias(2) who will help characterize them and describe their role precisely. It's the early'80s. A ceramide is a sphingolipid resulting from the combination of a fatty acid with sphingosine via an amicable affair. These ceramides are essential components of the outermost layer of the epidermis, the stratum corneum, whose integrity helps maintain skin hydration by acting as a barrier. They represent nearly 40% of the lipids (fats) in this layer (along with cholesterol and fatty acids) and are like the cement of a brick wall: they connect the dead cells together, slowing the loss of water from the body and the penetration of harmful substances from the outside, while giving flexibility and cohesion to the whole. In the human stratum corneum, 9 to 11 ceramide classes have been identified. 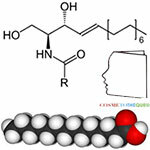 Acylceramides (CER 1, CER 4 and CER 9) have a remarkable molecular structure; indeed, a linoleic acid is bound to a ω-hydroxy-acid by an ester function with a chain length of 30 to 32 carbons. Very quickly, we will associate ceramides with hydration and we will consider that the decrease in ceramides causes dryness, itching, desquamation and cracking of the skin. This group of substances will therefore be highly topical and the cosmetics industry as a whole will use this concept in the development of new moisturising products in particular. A first period will consist in searching for biological sources rich in sphingolipids. This is how some specialities based on medullary extracts will see the light of day and will be available to brands. But this period will last only a short time because the worries associated with mad cow disease will cast suspicion on these extracts. From then on, research will be directed in two directions: - the search for synthetic ceramides, - the search for sources of plant ceramides. In this contribution, Yves Le Guen and Karl Lintner recount the research that preceded the development of the first synthetic ceramides, also called pseudoceramides. Thanks to them. In 1983, Wertz and Downing published an article entitled:"Ceramides of pig epidermis: structure determination" which was followed by numerous other publications on the topic of ceramides in the skin. 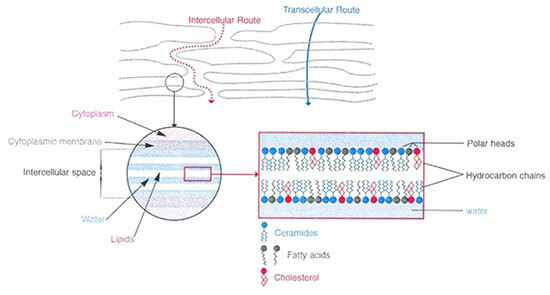 It is a very thorough analysis of the lipids that constitute the"cement" between the corneocytes ("bricks") according to the very popular model of the structure of the horny layer (stratum corneum) of the skin (Brick & Mortar model according to P. Elias(2). The authors describe the fine structure of the seven families of ceramides and their interpretation of their functions in the lamellar bilayers according to the model below. Today, we know 11 ceramide families and much more is understood about their structural and sometimes biological role. Of course, pharmaceutical research is interested in these substances in order to better understand and treat, if possible, the symptoms and/or causes of atopic dermatitis (AD) or psoriasis. The problem encountered very quickly is the question: how to obtain the ceramides constituting the skin? The structure (schematized opposite) does not seem so complex. This structure is only one model representative of the 11 families: it is characterized by an amide bond between an amino and hydroxylated fatty chain (sphingosine) and a fatty chain of a fatty acid. Four main details can vary in this molecule: the presence (in sphingosine) or absence (in sphinganine) of the indicated double bond; the sites and number of hydroxyl groups, as well as the lengths of the two fatty chains which can sometimes reach C 30 even more. Sometimes a hydroxyl group in the omega position of the acid is also encountered, especially on very long chains. How can these substances be obtained for possible use in medicine? The only syntheses described turn out to be more difficult than expected: twelve stages, some under nitrogen and at -70°C with very low yields… Even if"health has no price", progress is slow. Natural sources are not legion. In fact, ceramides are obtained in our body through two pathways: - either the N-acylation of a sphingosine which is synthesized by serine and palmitoyl-CoA via a specific enzyme; - either by hydrolysis of sphingomyelin, a phosphorylated derivative of ceramides found in significant amounts in the brain and in all nervous tissue (myelin sheaths) or by hydrolysis of glycosphingolipids (glycosylated ceramides=glycocerebrosides). The whole profession was interested in these"ceramides" and"cerebrosides" for the concept"repair/reinforce the skin barrier". Studies to show a benefit of the use of a ceramide or sphingolipids in a cosmetic product (skin care cream) have effectively succeeded in showing that one could decrease the PIE (insensitive loss in water, TEWL in English), and thus better hydrate the stratum corneum. With the time necessary to prepare the launches of the ranges, the publication of Wertz and Downing saw its impact on the formulations of the years 1988-89… The researchers of the cosmetic industry were quickly to understand the interest of these substances to include them in moisturizing, softening, repairing creams of the barrier. For these applications, no isolated, purified and analytically characterized 99% substance is required. These sphingolipids and glycocerebrosides, glycosylated derivatives of cutaneous ceramides, could advantageously be used for these same applications. And instead of synthesizing them, they could be extracted from the lipids surrounding the neurons in the brain and spinal cord of the beef, and purified to an acceptable degree. This was done by a number of suppliers (first in Japan, then in other countries) and offered to the cosmetics industry. Research therefore focused initially on the preparation of sphingolipids and cerebrosides from animal sources (especially beef brain), which it was hoped could be made into neutral ceramides. Although this route was not simple (low yields, variable composition depending on extraction and purification processes), it remained competitive compared to pure synthesis. Dermatological pharmaceutical applications were therefore slow in coming. How to replace these beautiful molecules so useful? The various plants contain only minute quantities of ceramides or cerebrosides, their extraction is difficult, the products thus obtained were very (too) expensive, even for use in low doses. Admittedly, preparations containing glycolipids, including a very small percentage of true ceramides (A ceramide must contain an NH-CO amide bond to deserve this name; this bond is easily detected with a simple Infrared spectrogram around 1640 cm-¹, but is rarely observable in"vegetable ceramides"…), have been proposed, and sometimes used but the heart was not there. The idea, often used in the search for active pharmaceutical ingredients, i.e. to find similar substances in structure, analogues, potentially also active but easier to approach synthetic, was born at that time (1990-91). A collaboration between the Sederma company and the chemists of the Panchim company on an ANVAR and Grand Projet Innovant research programme (of the Ministry of Research), spread over three years, was set up. The hiring of a competent chemist allowed Panchim to synthesize a good number of analogues of these complex structures, where two more or less hydroxylated fatty chains are attached between them by an amide bond. Sederma's colleagues in this cooperation formulated the creams to test potential skin barrier and hydration activities. At the same time, however, chemists tried to simplify the synthesis of ceramides identical to those found in the skin (this will be the subject of a later contribution from the Cosmetotheque). The result, after about a year, was the following structure, commercially called HO3 CERAMIDE (the name"HO3" came from the fact that the acyl part had three OH hydroxyl groups…). This molecule had the shape and certain characteristics of"real" ceramides, obtained in the form of white powder, purity > 95 % and totally free from the bad press of"mad cow", since nowhere did bovine matter intervene. The basic components used to make this analogue were nevertheless of natural origin (aleuric acid, myristic alcohol). A clinical study showed that this ingredient, with the name CTFA (INCI) unpronounceable"Trihydroxypalmitamidohydroxypropyl myristyl ether", could fill the intercellular space between corneocytes previously defatted by aggressive treatment, and made it possible to claim the"repairing effect of the skin barrier". Other studies related to hydration and CIP, firmness and cellular cohesion, followed quickly. HO3 ceramide is not a"real" ceramide identical to one of the 11 currently known structures, of course. But it showed that with a great effort in creativity in the field of chemical synthesis, it was possible to quickly replace an unexpected problem arising from the natural domain, in a safe, effective and credible way. This success then led to the continuation of research into chemical synthesis (a"real" ceramide was proposed by the same players as well as by other suppliers a few years later), as well as to the emergence of other ingredients, either also to the proposal of analogues of ceramides, or to the production of naturo-identical ceramides by biotechnology (cf. next contribution on this theme). Notes (1) J Lipid Res. 1983 Jun;24(6):759-65. Ceramides of pig epidermis: structure determination - Wertz PW, Downing DT. (2) Elias, Peter M. Epidermal Lipids, Barrier Function, and Desquamation.- Journal of Investigative Dermatology . Jun83 Supplement,. 80, p44s-49s. Contribution by Dr. Yves Le Guen and Karl Lintner. Yves Le Guen is a graduate of the École de Chimie de Paris. From 1963 to 1972, he was in charge of research at the pharmaceutical laboratories Innothera Chantereau in Arcueil, and obtained a Doctorate of Science from the University of Paris. From 1972 to 1988, he was Director of Research and Development at PCAS in Longjumeau. In 1988, he and a friend founded Panchim in Lisse. This laboratory specializes in pharmaceutical and cosmetic chemistry, first on a bench scale, then in industrial scale production. Following the sale of the Panchim/Pharmasynthèse group in 2006 to the Japanese company Inabata, Yves Le Guen continues as a consultant to focus on cosmetic active ingredients and introduces three innovative anti-wrinkle, whitening and anti-redness products on the market. Karl Lintner (who coordinates contributions to the Cosmetothek® on peptides) is a Chemical Engineer from the Technical University of Vienna (Austria) and holds a PhD in Biochemistry from the same University. After 10 years of research on Biological Peptides at the Saclay Center for Nuclear Studies, he joined Henkel KGaA in Düsseldorf (Germany). In 1990, he became Technical Director at Sederma (Active Cosmetic Ingredients Development), then General Manager. Among the many achievements of this company, the introduction of the Peptides concept to cosmetic applications ("MATRIXYL®") is particularly noteworthy. Winner of several Innovation Awards for Sederma, he is the recipient of the In-Cosmetics Life Time Achievement Award 2013. Associate professor at the UVSQ, he is an internationally recognized lecturer in the world of cosmetics. He provided details on the role Sederma played in the HO3 CERAMIDE adventure.